Office of the Principal Controller of Defence Accounts (Pensions), It is responsible for the grant, payment, audit and adjustment of all claims of pensionary awards of Defence Services Personnel (except retirement/death benefits of Air Force and Navy personnel) and civilians of the three Services including those of the Defence Accounts Department, GREF, COAST GUARD, MNS (local), NCC Officers, Departmental Canteens and Statutory Canteens and their families. The pension work relating to the personnel of all the three wings of the armed forces and also the civilian employees serving in Defence establishments is centralized at one place viz. PCDA (P) Allahabad to secure uniformity in the application of rules and procedures regarding grant and audit of pension. 1. Timely Submission of Pension Claims: Application for grant of pension /gratuity /commutation/revision should be submitted to Head of Office/RO concerned. The application should be submitted well in advance so that it reached the PCDA (P) Allahabad office (through HOO) at least three months before the date of your retirement. 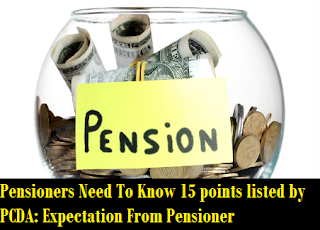 Only then it can be ensured that the Pension Payment Order (PPO) reaches you (through your HOO/RO) before your retirement. 2. Reminder /queries to know status of a claim: There is thirty days drill for PCDA (P) office for notification of pension/Family Pension (and 60 days drill for Disability/WIP cases). Therefore once a pension claim is sent to the PCDA (P) office, reminders/FAX /queries regarding that claim should not be sent for atleast 35 days (65 days for Disability /WIP cases) from the date your claim is sent by your RO/HOO to PCDA (P). The queries should be sent to the officer-in charge of that section (which can be seen from ‘Organisational structure’ on this Website along with the references/letter number under which claim submitted. 3. Check the PPO: On receipt of an intimation memo relating to notification of your pensionary awards/copy of PPO, you should check that the pensionary awards have been notified correctly as per extent rules. 4. Corrections required in your PPO: If you feel that some correction is required in your PPO, you should contact your RO/Head of Office /Pension Disbursing Agency (PDA) for taking up the matter with Principal Controller of Defence Accounts (Pensions), Allahabad. 6. Annual identification: For Annual identification you should appear before your PDA/submit Life Certificate failing which your pension may be stopped. 7. Loss of PPO: Where the P.P.O. (Pension Payment Order) notifying your pensionary awards has been lost you should make a request to your P.D.A. to furnish a Loss Certificate to the P.C.D.A. (P) to obtain a duplicate copy of P.P.O. 8. In case of re-employment in any Central or State govt./Autonomous bodies/Public Sector Undertaking, the full facts of re-employment should be given by you to your PDA (Pension Disbursing Authority) immediately after re-employment occurred. In case of non-re-employment, a declaration to this effect may be given to your PDA, once in a year in the month of May positively. 10. In case there is a handicapped child, the details of your family members including the name of handicapped child should be given to your RO/HOO and an acknowledgment should be obtained. 11. In the event of conviction by a court of law, full facts of the case should be reported to the PDA/P.C.D.A.(P). 13. References to PCDA(P) Office: If you desire to make a reference to the office of PCDA(P), Allahabad on any issue, please quote your PPO No,(under which your PPO was originally sanctioned, and also latest Corrigendum PPO number) apart from other details . 14. For restoration of commuted portion of pension after 15 years, from the date of receipt of commuted value of pension, please apply to the PDA on the prescribed form as PCDA (P) has got no role in this regard. 15. Please nominate the person to whom you want to authorise Life Time Arrear on your demise and submit the nomination form to your PDA. In case you want to change it please submit a change nomination form to your PDA to avoid hardship to your nominee to get the amount of Life Time Arrears .